On the heels of posting the Chicken Rap, here's some great news from our own city. Our council suspended our city's two-chicken-per-household limit! You can read more about it here. It will be interesting to see what they come up with for a future chicken rule. I'm obviously hoping for one of the first two. In order to have eggs for a family of four, you really need 5 - 6 chickens. Residents in Salem, a town just an hour up the I-5 corridor from here, are fighting for their right to keep backyard chickens. Here in my town, the city council just discussed increasing the flock size on urban lots from the three that the law currently allows (as most chicken owners know, there's virtually no way to keep only three chickens - what if one dies, you can't just get one baby chicken and introduce it, they're flock animals for pete's sake!). This rap video pokes some fun at the more outlandish concerns that people have about urban chickens (leading to meth labs in the neighborhood? really people!). Strangely, folks are so concerned about harmless chickens. Yet did you know that dogs bit nearly 2% of the U.S. population - more than 4.7 million people annually? That over 800,000 of those bites are serious enough to require medical attention? That 1,000 people A DAY are treated in Emergency rooms for dog bites? And about 25 - 35 a year are FATAL? That most of the victims are children, half of whom are bitten in the face? That dog bite losses exceed $1 billion per year with over $300 million paid by homeowner's insurance? So after reading all of that, how on earth residents can be opposed to chickens amazes me! Quieter than a dog, less destructive than a cat, and safer to humans and other animals than either! Now don't get me wrong, I'm a dog owner and a cat owner and I would hate to give up either. But in a city like Salem where you can keep up to a 100 pound pig as a pet, what is wrong with a couple of chickens? In the front garden, I've got all of my pole beans planted, a week earlier than last year. And Wayne fenced off a new area to transplant all of the tomatoes from our cold frames. 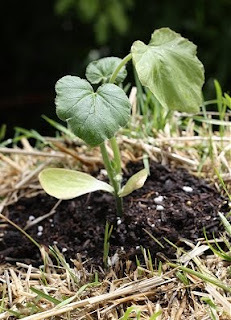 It's funny, but they took so long to germinate that I thought it was a bust to try to grow them from seed, so I went out and bought some tomato starts. No sooner did I have those installed in the back garden than my cold frame tomato seeds took off like wildfire. Now the tomatoes in the cold frames are almost as big as the starts I bought! So the bottom line is that I have 12 more tomato plants than I bargained for, which means I guess I'll be canning a lot of salsa this year. You can read my post on my Ironmom blog about why this Ride is so important and cyclist safety continues to be an issue taken far too lightly by far too many motorists with far too many fatal outcomes for cyclists. The annual Ride of Silence is May 19 at 7:00 pm. You can find a location near you at their website. Strawbale gardening: it's not something I'd heard of until this year. 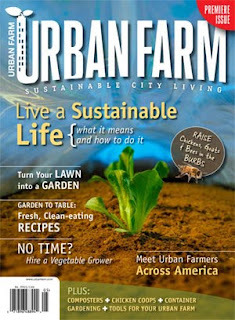 My friend loaned me the book Food Not Lawns , an excellent resource for yard transformation which I'm reading, and we've been thinking on how we can restructure our massively sloped north-facing back yard to be more of a food producing zone in the "paradise garden" style that the author discusses in that book. But that's a multi-year project to say the least. In the meanwhile, we had some pressing problems like how to effectively fence off our raised beds from the pups that joined our family this year, what to do with the big dirt patch in the middle of the lawn where the trampoline was until recently, where to put the blueberries and raspberry starts (hopefully in a dedicated berry patch) and how to keep some lawn for the dogs while beginning to transform the rest. Enter the strawbale! Did you know you can grow things right in a strawbale? 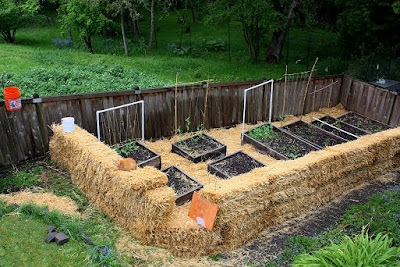 You basically put the bale where you want it, get it wet to start the decomposition process, wait a few days, make a hole in the top and put in your plants. So our new fence around the raised beds is now going to be a double-high strawbale garden, thus giving us even more growing room with no extra digging or planning for the year. 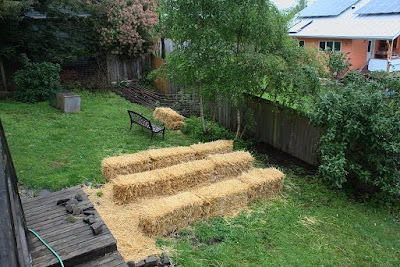 We've mulched in between the raised beds with straw, in the eventual plan to turn the beds into a more free-flowing design with water channels to reduce water needs. For the next couple of years, the strawbale mulch will begin this process by turning the paths to more usable ground. And that big dirt hole where the trampoline was located? Now covered with straw bales which will house even more plants. The new berry patch is fenced off with twine in the upper right corner of the yard. Stay tuned for how the big strawbale experiment turns out! Motherhood, a transformation from a life in which it's easy to only think of yourself to a life when by necessity and by the overwhelming power of love you think of others first. Mother's Day, a day to rightfully celebrate all that is wonderful about mothers. When you look at the fuzzy little head of your newborn and hold them to your breast, the concept of war is unthinkable. When you bounce your toddler boy on your lap, the idea of him being drafted to go kill other human beings is unimaginable. Now my baby boy is a teenager, the reality of the day he has to register for the draft looms closer. I think it's worth taking a moment to contemplate the origins of Mother's Day, before it was co-opted by the forces of commercialism. In 1872, Juulia Ward Howe, the woman who wrote "Battle Hymn of the Republic", proposed an annual Mother's Day for Peace. On the heels of the horrible carnage that was the Civil War (over half a million dead, the costliest war in our history), Howe was committed to idea of abolishing war. In her Mother's Day Proclamation, Howe wrote: "Our sons shall not be taken from us to unlearn all that we have been able to teach them of charity, mercy and patience. We women of one country will be too tender of those of another country to allow our sons to be trained to injure theirs". For 40 years, Americans celebrated Mother's Day for Peace. Then, our memories of the horrors of war grew long, and the powerful forces of commercialism grew stronger. Mother's Day was moved from June into May, and businesses quickly saw the opportunity to co-opt a day of activism and turn it to a day of moneymaking. As a Florists' trade journal stated bluntly, "This was a holiday that could be exploited". And exploited it has been. Mother's day is now a billion dollar "industry" and the political activism of our great-great grandmothers is all but forgotten. For myself, I've always asked that my family not buy me anything for Mother's Day. I don't need flowers or Hallmark cards. If they want to cook me breakfast or make me something handmade of course I am always grateful. My own Mother's Day tradition has always been to head out to a lake for my first open water swim of the year, and so yesterday we went over to the coast to a small inland lake and enjoyed the day as a family and with friends and I got to swim. But while our Mother's Day is not commercial, I've also discovered it's not really honoring the original intent of the day, so I am putting a note on my calendar for next April, I am pledging that I will find a way to celebrate Mother's Day by activism for peace, justice, and the good health of our land and our children. Read the original Mother's Day Proclamation and more history of Mother's Day here, and pledge to take back Mother's Day for Peace!